Yellow Belt training provides individuals with an awareness of the tools needed to participate as a Lean and Six Sigma project team member. Individuals are encouraged to bring a live project they are working on to the training. Throughout the training, in teams of three to four, they will have the opportunity to apply concepts and techniques to real projects they are currently working on. This training will allow employees to be valuable assets to drive the organization’s goals and objectives in the future. Develop process improvement techniques used within the DMAIC model to improve the capability of a process. Communicate using Lean Six Sigma concepts to staff and management. 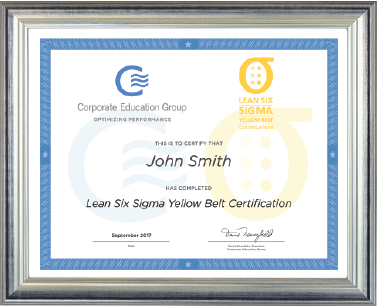 The Lean Six Sigma Yellow Belt Certification Program consists of two days of classroom training. The program is also available in a virtual, Instructor-led format. To achieve Yellow Belt Certification, each participant must successfully complete the course which includes attending all sessions, completing assignments and passing a final exam. Participants who opt for the CEG/Duke University Management Training Lean Six Sigma Yellow Belt Certification Program are required to pass a mid-point exam at the end of day 1 to earn a co-branded certificate of completion jointly issued from CEG and Duke University.